Last fall when Jasmine and I began talking about a potential Vietnam trip, I started getting excited about all the food we would eat. A big inspiration for the trip was the caving trek, but as long as I could get in a few bowls of bun cha and pho, I was down. In seven days, we did our best to sample as many dishes as we could. Here goes! 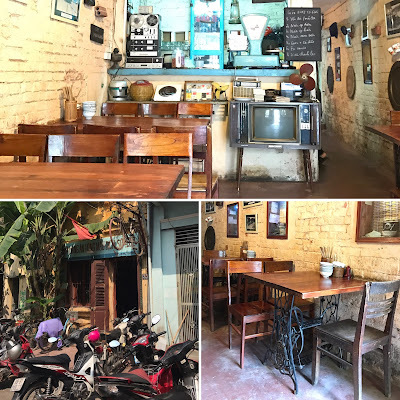 It's no secret that I'm not a coffee drinker, but I'm always game to try anything when traveling, including the intriguing-sounding "egg coffee" that graces many of Hanoi's cafes. It was just the perfect drink for me, as the creaminess/custard quality of the egg masked the bitter taste of coffee beans. If you're a coffee purist, you might scoff at this creation, but it certainly provided a nice buzz of energy nonetheless. As the story goes, egg coffee came about in Hanoi during the mid-20th century when milk was scarce and egg provided a creamier (and tastier, if you ask me) alternative. It's stuck around and you can find many egg coffee cafes in Hanoi. It comes in an espresso size cup which is then placed in a slightly wider and more shallow cup filled with hot water to keep its temperature warm. Koto (Know One Teach One) is a social enterprise founded by a Vietnamese-Australian fellow whose aim is to empower at-risk and underprivileged youth by giving them useful training in hospitality so that they can improve their lives. We enjoyed a satisfying multi-course prix fixe meal from appetizers to dessert. State Run Food Shop 37 models itself after the government-run restaurants during the austerity period beginning in 1976. You purchase ration coupons (as seen in the picture below) which go towards your meal. Lunch: fried morning glory (our "birth" flower, haha), spring rolls, rice, etc. We had some time to kill (before heading to the train station) after we got back to Hanoi, so we went to another place for egg coffee. Not quite as good as Cafe Giang, but still did the trick. At the end of the first day, we went for a quick dip in the ice cold waters at our campsite, and hung our muddy clothes to "dry" before the following day's trek. (Spoiler alert: one night in February is not nearly long (or warm) enough to render clothes dry.) We meandered around the camp site, set up our sleeping bags, and got ready for our group dinner. The Oxalis cooks were talented- whipping up everything from grilled meats cooked over open coals for dinner to homemade crêpes in the morning. Just a sampling of our amazing dinner cooked outside: homemade French fries, tofu topped with flavorful tomato sauce, rice, grilled eggplant, chicken, soup, steamed greens, delicious cabbage. They also gave us local "moonshine" aka rice wine that could knock your socks off. A digression from the food: on day two of our trek, we awoke in our tents and set out putting on our clothes for the day. Since Jasmine and I were paranoid about leeches (from the group we met at our homestay two nights before), so I decided to reach my hands into my muddy boots before putting them on in case there were any leftover from the previous day's muddy trek. I felt something rubbery and immediately pulled my hand out only to see a huge spider in my boot. I screamed and tossed the shoe a good 10 feet. Bao, our guide, came over and was able to knock the spider out of my boot, while remarking, "Oh yeah, that's definitely poisonous." What a fright. The day two trek was an experience from start to finish and it was the the perfect blend of adventure, unknowns, and challenges without seeming impossible. By the end of the second day, we were exhausted but felt like we'd accomplished so much. Back at base camp, we showered off two days worth of caked-on mud (quite possibly one of the best showers of my life) and packed up our stuff before the Oxalis van took us down the dirt road to a local family's home for one final meal as a group. 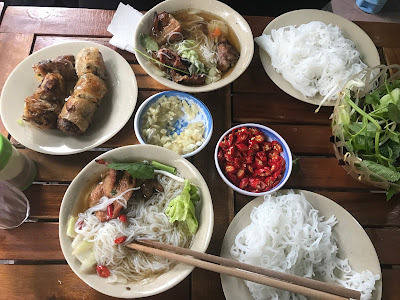 We cracked open cans of refreshing cold Coke as we slurped on mi quang, a savory soup of thick noodles, tomatoes, tofu, crushed peanuts, herbs, limes, and chili. According to Bao, our jack-of-all-trades trek leader, the dish is originally from Hoi An but served in a smaller bowl there. Delicious beef noodle soup at an makeshift place on the sidewalk near Beer Corner. No sooner than I could finish the bowl did the cops shut down the place and make the owner dismantle his impromptu "restaurant"
The address plates in Hanoi were identical to those in Paris, a random remnant of colonization? Little stools are the way to go for sidewalk eating- great for a short person like me! And finally- many streets in Hanoi are dedicated to selling solely one item, i.e. Mirror Street (pictured above), Sunglass Street, etc. What an adventure. Vietnam, I hope to return!